If you want your cheeks to be the most radiant at the party, this is the perfect highlight for you. The formula is buildable and with a gorgeous finish that doesn't emphasize texture. They have a bountiful shade range which means anyone can find a highlight that suits them. My favorite shades are Opal, Moonstone, and Champagne Pop (I have a light/medium skin tone with olive undertones for reference). If you are a fresh faced qween, then you *need* some of these in your life. One drop and you are instantly bathed in a veil of metallic shimmer. Those weary of a blinding glow need not apply. The shade range is beautiful, my favorites include Rose Gold + Celestial. This one is one of my all time favorite liquid highlights. 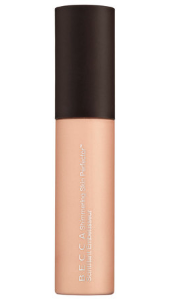 The formula is soft and can be mixed with foundation to add radiance to a matte foundation. 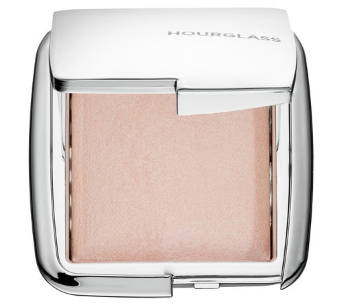 This highlight wont emphasize texture and looks beautiful on mature skin. I keep the shade Opal stocked in my pro makeup kit at all times. This powder is perfect for my natural glam makeup lovers. With one swish of this majestic lightweight powder gives your face an ethereal glow. Get your hands on this more expensive (yet totally worth it) palette for just $62! Or get the mini version for $24 and save the other $24 for more makeup. Or get two minis for the price of one full sized item. There's really no wrong way to glow here. 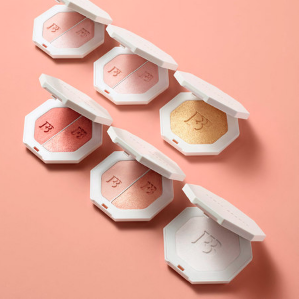 What's not to love about Fenty Beauty by Rihanna? Since their launch they have rocked the beauty world with their quality and inclusivity. Their highlighters are buttery, long lasting, and gorgeous. Most come with two shades, one subtle and one more intense highlight. My personal favorite duo is Mean Money/Hu$tla Baby.